* J.L. 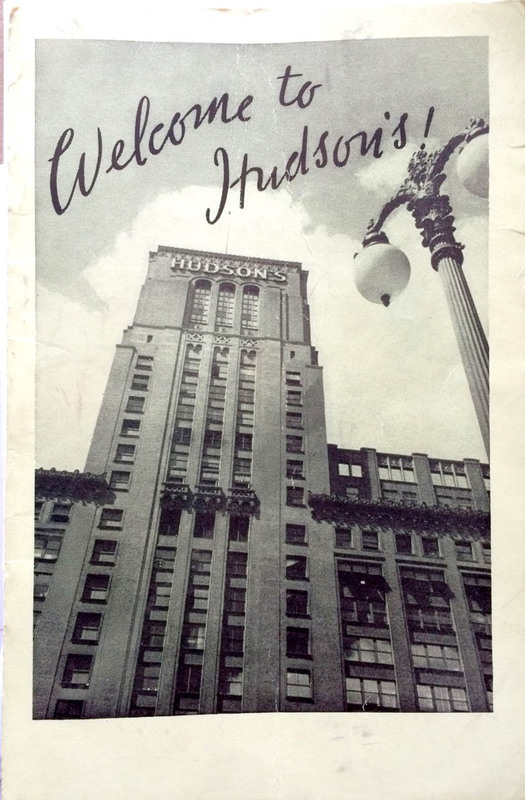 Hudson was the iconic department store in Detroit rivaled only by New York’s Macy’s in its heyday. 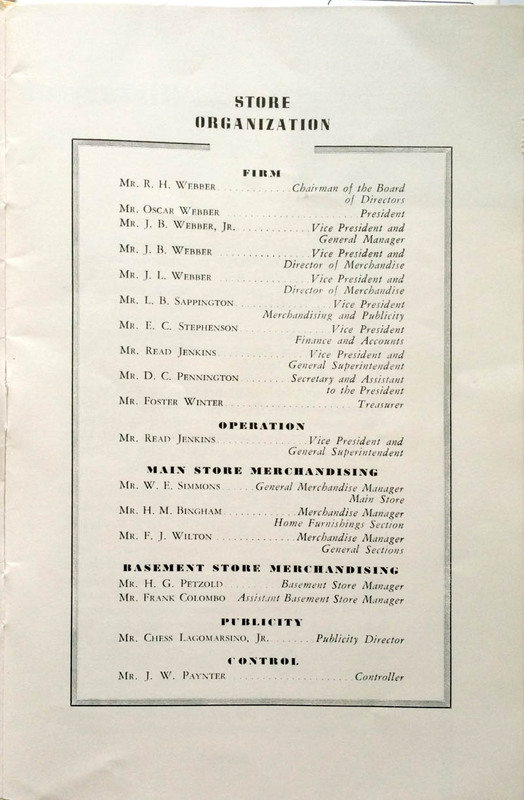 At the time this handbook was written the flagship store was 24 stories tall with 4 basements underground and a total area of 2,124,316 sq. feet. 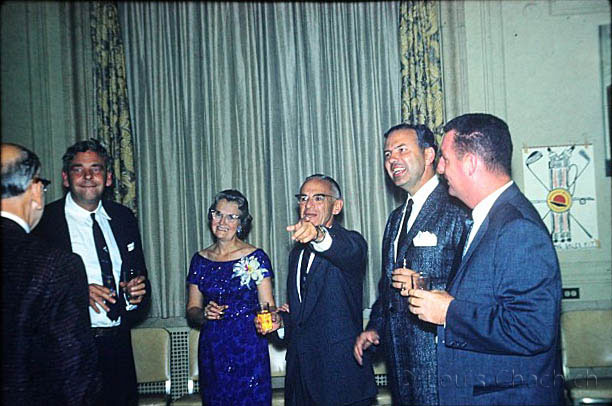 Here is a shot of Milan Borchich at my aunt’s wedding in 1960. I assume it’s his wife and daughter in the shot but I don’t know for sure. I couldn’t find any records of a wife or daughter. 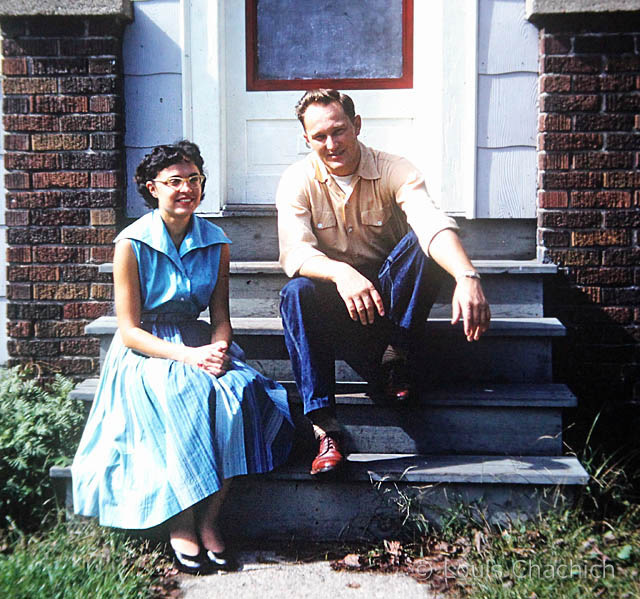 I think this photo was taken in 1953 because they are sitting on the stoop of 19357 Carman St in Detroit (Highland Park) which is the house my parents bought before my dad got transferred to Chicago in 1954. My grandfather took it over and it became a rental house. Ernie died two years ago today. This strapping young man turned into a strapping old man. Here’s a copy of his obituary. 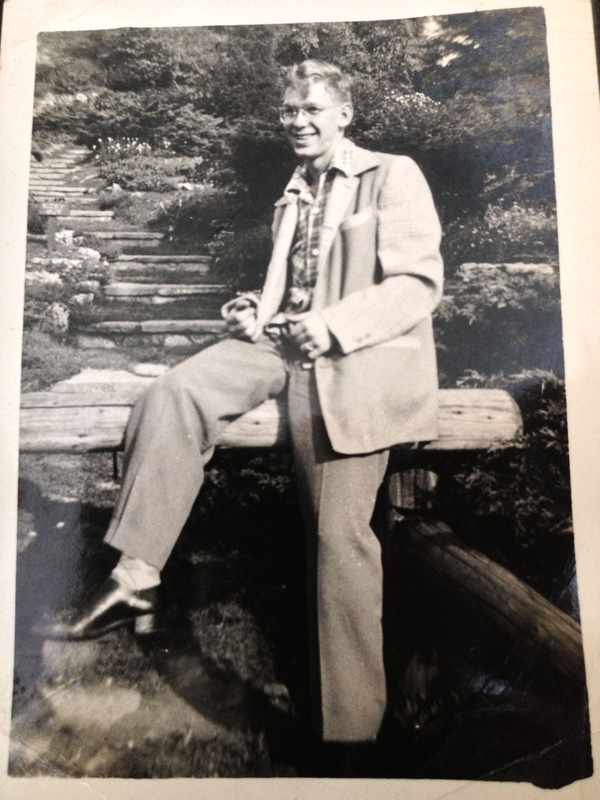 Here’s text from the obituary to help his descendants find this photo some day. Here’s a shot from the 1950s my father took at an American Standard company event. American Standard was a plumbing and heating company and the brand still exists today although owned by some other corporation I’m sure. 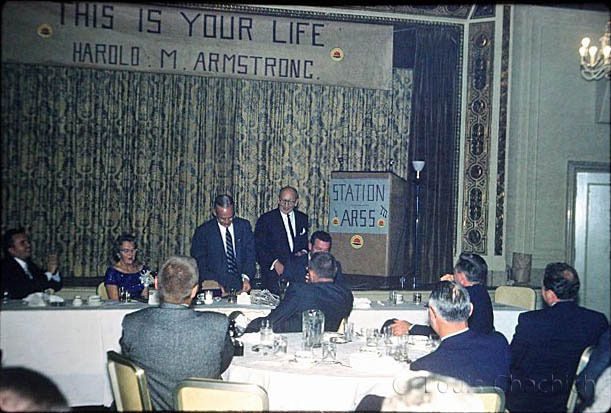 Note the Harold M. Armstrong: This is Your Life banner. Is it a Comedy Central roast? No… It appears to be a retirement party for Mr. Armstrong. I don’t know what Station AR55 means. Perhaps the office code for the Detroit office. No idea of the names of the other guys standing around. Coworkers of my dad. Mr. Armstrong was the branch manager who hired my dad in 1952 so this guy had a direct effect on the trajectory of my Dad’s (and thus my) life. It certainly ensured that most of the scrap paper we used in our house when I was a kid were engineering drawings for sinks, toilets and the like. Most likely this is the Harold Armstrong with SSN 374-05-0466 who was born September 6, 1893 and died June 29, 1976 in Broward County Florida at the age of 82. So that means he had a long and (probably) happy retirement. Good for him. According to the 1954 city directory for Birmingham (MI), Harold was indeed the branch manager for American Standard and lived at 6105 Gilbert Lake Rd in Bloomfield Township with his wife Josephine Armstrong. According to Zillow, that house was built in 1952 and has 2046 sq. ft. and has 4 bedrooms and 3.5 bathrooms. Josephine may be his second wife. There is a 1940 Birmingham city directory entry for Harold M & Mildred Armstrong at 579 Puritan Ave and he is Branch Manager for American Radiator Company. In 1940 census, he had a son Richard who would have been born about 1937. 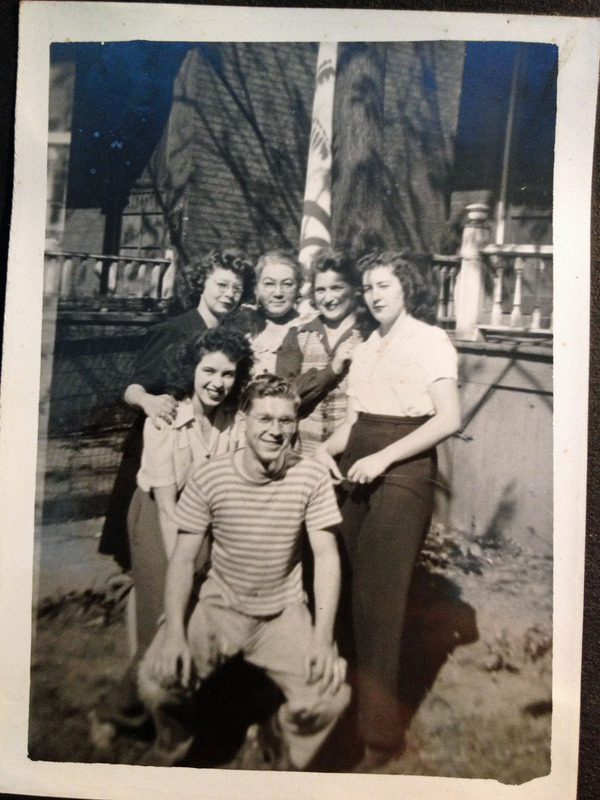 Here is a photo of Johnny DesRosiers (my dad’s best friend in the early 1940s) and his sisters and mother. Presumably it’s in front of their Detroit house (not sure where). If I’m correct, depicted is John, his mother Agatha, sisters Noella and Antonia and possibly a sister-in-law (Mary?). John also had an older brother, Joe, who died in WW2 (Aime Joseph Des Rosiers). Johnny Desrosiers was my father’s best friend in Detroit around 1940. He was from a French Canadian family that moved to Michigan. 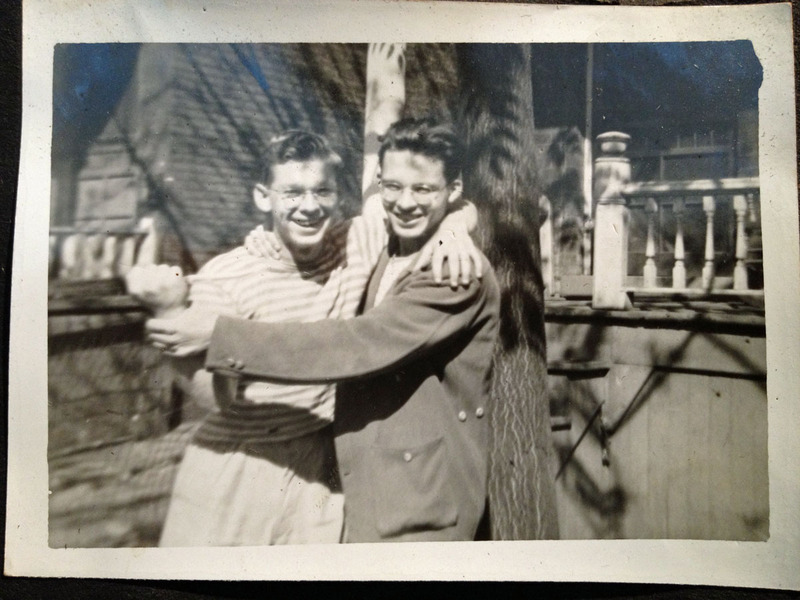 These photos would have been taken around 1942. Location of the “park” is unknown but almost certainly within Detroit, Michigan. Belle Isle perhaps. 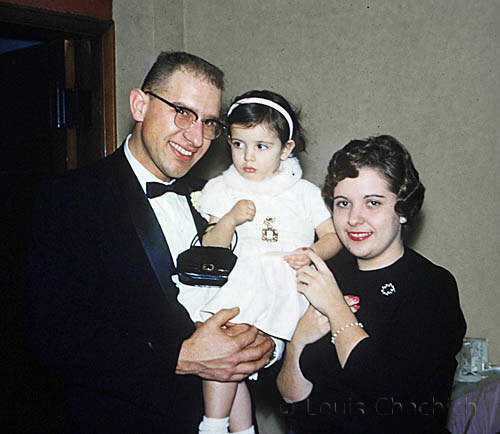 On the right side of the photo is my dad, Louis Chachich. I believe this is the John DesRosiers who was born 12 June 1927 and died 5 June 2001 according to social security databases. According to my mother his wife’s name was Lillian and was of Polish descent.